Ativan is a powerful benzodizepine with a high risk of causing physical dependence and addiction. Here, we answer how you can recognize physical addiction to Ativan and what treatment is like. Ativan (generic name lorazepam) is a strong sedative medication prescribed for the management of sleeping disorders and anxiety. It produces effects similar to other benzodiazepine medications. In fact, Ativan can cause physical and psychological dependence. But how do you know the difference between normal use and a drug problem? Here, we discuss signs of dependence so that you can know if you or someone close to you is physically or mentally addicted. Then, we discuss how addiction can be treated. We’ll explain the common course of treatment and therapy options in detail. Finally, we invite you to ask questions or share your experience in the section at the bottom of the page. We try to respond to all real life questions with a personal and prompt reply. People who become physically dependent on Ativan exhibit withdrawal symptoms when they stop taking it or lower doses significantly. After a period of regular use, you may also start to feel the need to increase doses in order to be able to relax and sleep normally again. This phenomenon is called tolerance. Both dependence and tolerance are expected outcomes of regular use of Ativan over a period of weeks or months. In fact, physical dependence on Ativan is associated with chronic use of Ativan. But what really happens when you become drug-dependent? When you become dependent on a psychoactive drug like Ativan, your body becomes adapted to its presence. Ativan is made of chemicals that act on your brain and central nervous system. When you take it for an extended period of time (several weeks or months), the body grows used to it…and then comes to depends on it to maintain balance and function normally. What happens then? Withdrawal signs and symptoms when Ativan is discontinued, or doses are significantly lowered. In many cases, physical dependence is the predecessor of addiction. Often, people who are dependent on Ativan continue using it to avoid withdrawal. Or, people increase doses to compensate for increased tolerance. In these cases, addiction can develop as an undesired side effect of use. So, contrary to popular belief, you can become addicted to Ativan even if you started using it as prescribed. In brief, becoming addicted means that you are unable to stop using Ativan…even after you go through withdrawal. It is a psychological (not physical) need for the drug. Conversely, dependence is an expected outcome of regular use of Ativan. Drug dependent people go through withdrawal and can take or leave Ativan at will. Ativan’s addiction potential does not come only from its chemical properties. The length and frequency of the Ativan use are also a contributing factor. Because Ativan causes relaxation, it can also be used recreationally. But more often, Ativan becomes addictive as it allows you to overcome your sleeping or anxiety problems and then you come to believe that you cannot live or function without it. You feel a strong need and cravings for Ativan. You are constantly thinking about Ativan. You are unable to be relaxed and calm without Ativan. You are unable to function without Ativan. You can’t overcome your sleeping and anxiety problems without Ativan. You have several failed attempts at quitting Ativan. You obsess over obtaining and using Ativan. TIP: If you suspect that you or a loved one have become addicted to Ativan, do not deny it. Instead, ask for help and encourage treatment. Long-term Ativan addiction can lead to serious health problems and, in some cases, irreversible damage. Ativan addiction symptoms can be treated using mainly behavioral and psychotherapeutic modalities. Structured treatment programs can provide successful recovery and relapse prevention therapies. Ongoing Ativan treatment can take place in an inpatient rehab center or via an outpatient treatment program. At the beginning of a stay in treatment, the medical staff will work with you on developing an individualized treatment plan. This plan will be based on an initial intake process which should include a full medical history, physical exam, questionnaires or interviews, and drug testing. If you require a withdrawal, you can expect Ativan doses to be gradually decreased under medical supervision and according to a tapering schedule. During the process of medical detox, your body starts to eliminate lorazepam. Withdrawal effects are a normal and expected occurrence at this stage, but it is important to detox under medical supervision. This way, symptoms can be addressed as they occur. After detoxification, you will engage in formal “treatment” based on talk therapy. Support groups, counseling sessions and alternative types of therapies can assist your recovery process from Ativan addiction. In fact, a combination of behavioral and cognitive therapies appears to be mostly effective in helping you achieve and maintain an Ativan-free life. 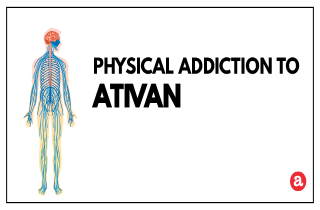 Do you still have questions about Ativan’s physical addiction potential? Please post them in the designated section below. We are happy to help answer your questions personally and promptly. If we do not know the answer to your particular question, we will refer you to someone who does. I was prescribed Lorazepam for 5 years and came off it altogether very abruptly (doctor aided) 3 weeks ago. Main withdrawal symptom has been high levels of anxiety and irrational thinking that this will never get better. There are so many conflicting websites when it comes to timelines. How long should I expect to feel soanxious?